Helm of Superior Intellect. Card artwork. Item Type: Major in Farming, Minor in Witch Hunting. Prove that there is brains hidden within thine muscles. With the Helm of Superior Intellect, no one will call you brutish or simple-minded, and especially, never a Fool of a Took. With this item equipped, you will be able to form complete sentences, gain literacy, and rudimentary problem solving. Your mind will be open to the possibility of indoor plumbing, personal hygiene, and effective combat strategy. What? They can't all be jabs at your expense. The Helm of Superior Intellect is, of course, a joke on items that give bonuses such as Intelligence. 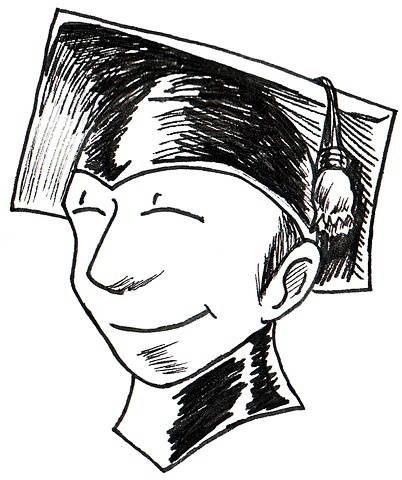 The symbol for achieving intelligence is the graduation cap, showing a very smug and proud character donning said helm.